Published: Dec 22, 2016 · Modified: Apr 12, 2019 · By Jen Sobjack · This post may contain affiliate links. 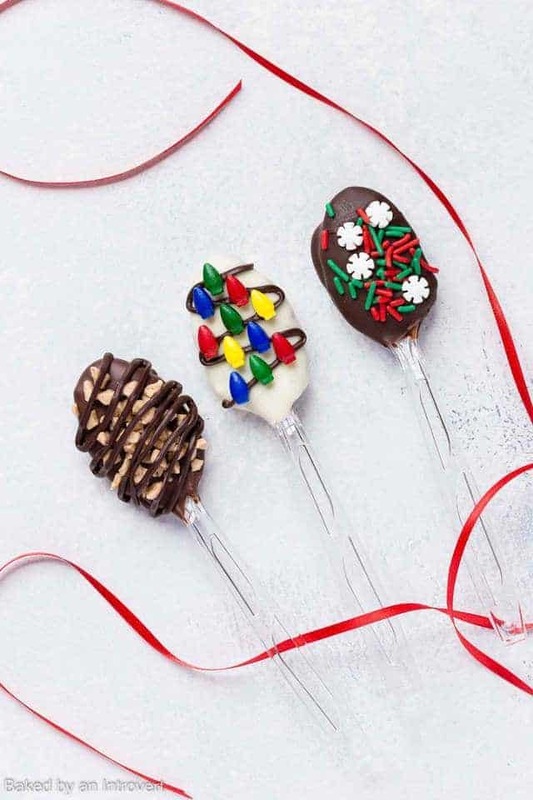 Chocolate Espresso Spoons are perfect for a last minute Christmas gift for your family, friends, and neighbors. Each spoon is layered with a rich chocolate coffee mixture and then coated with melted chocolate. Decorate them with colorful sprinkles and you’ll have a wonderful gifting option! Chocolate Espresso Spoons are perfect for a last minute Christmas gift for your family, friends, and neighbors. They are easy to make and festive for the holiday season. Package them with candied orange slices and peanut brittle for an extra special gift. Each spoon is layered with a rich chocolate coffee mixture and then coated with melted chocolate. Decorate them with colorful sprinkles and you’ll have a wonderful gifting option! Covering spoons with coffee and melted chocolate is one of the easiest and least expensive Christmas gifts you can make. First, you make the coffee base with is instant coffee granules mixed with melted milk chocolate. You can easily melt the chocolate in the microwave with a teaspoon of vegetable shortening. Once melted, add the coffee granules and stir it together. Scoop a large dollop of the mixture over the spoons you plan to give away and let them harden in the refrigerator. Now here’s the fun part. 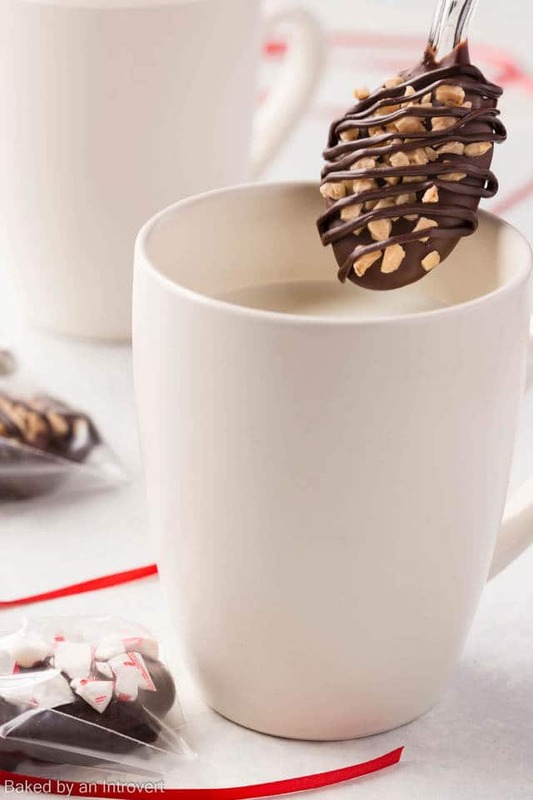 Dip the coffee spoons into melted chocolate of your choice and decorate them with Christmas sprinkles, crushed candy canes, and toffee bits. Which chocolate is best for espresso spoons? I went with Ghirardelli dark, semisweet, and white chocolate. I love Ghirardelli products and use them often in my baking. Use any chocolate you like as long as it is quality chocolate. You are making these as gifts so don’t sacrifice great tasting chocolate. Most of the time I use the double boiler method when melting chocolate. This ensures that the chocolate will melt slowly without seizing. But, because I needed to melt three different chocolates, I decided to melt them in the microwave. Place the chocolate in a microwave-safe bowl and add a teaspoon of vegetable shortening. Microwave in 30-second intervals, stirring between each one until the chocolate is melted and smooth. White chocolate can be tricky to melt. If it isn’t wanting to melt into a smooth consistency, try adding another teaspoon of shortening. You may need 2-3 extra teaspoons if your white chocolate is severely temperamental. Chocolate Espresso Spoons are perfect for a last minute Christmas gift for your family, friends, and neighbors. They are easy to make and festive for the holiday season. Each spoon is layered with a rich chocolate coffee mixture and then coated with melted chocolate. Decorate them with colorful sprinkles and you’ll have a wonderful gifting option! Combine milk chocolate chips and 2 teaspoons of the vegetable shortening in a medium microwave-safe bowl. Microwave in 30-second intervals stirring in between until chocolate is fully melted and smooth. Stir in the coffee granules until well combined. Spoon mixture onto plastic spoons, scrape off excess and place on a baking sheet lined with parchment paper or silicone mat. Refrigerate until set. Melt each remaining chocolate with 1 tablespoon of vegetable shortening in a microwave safe bowl following the instructions in step 1. Dip the coffee spoons into the melted chocolate and decorate with your choice of toffee bits, crushed candy canes, and sprinkles. Be as creative as you like. 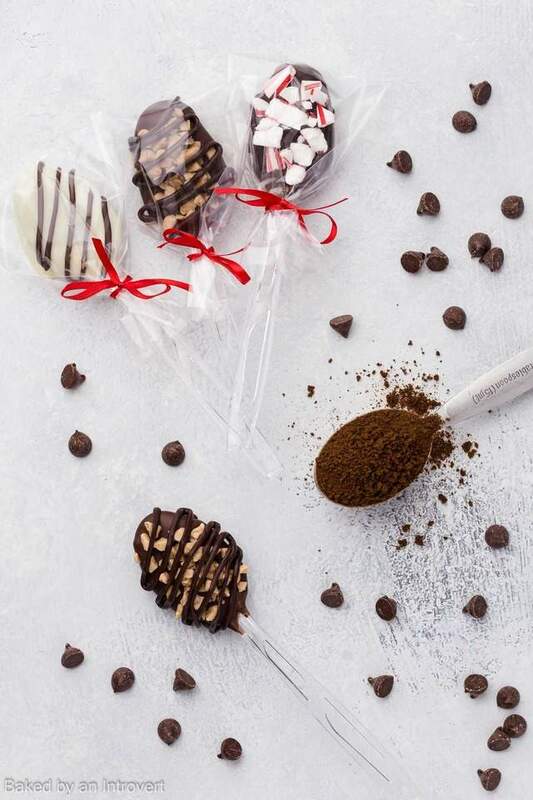 Transfer any unused melted chocolate to small piping bags and use that to decorate the spoons if desired. Refrigerate until set. Place in decorative bags for gifting. Wow nice idea will try 😀 This will best in kids birthday party. They will love this. All kids love chocolate. Thank you for this idea ! 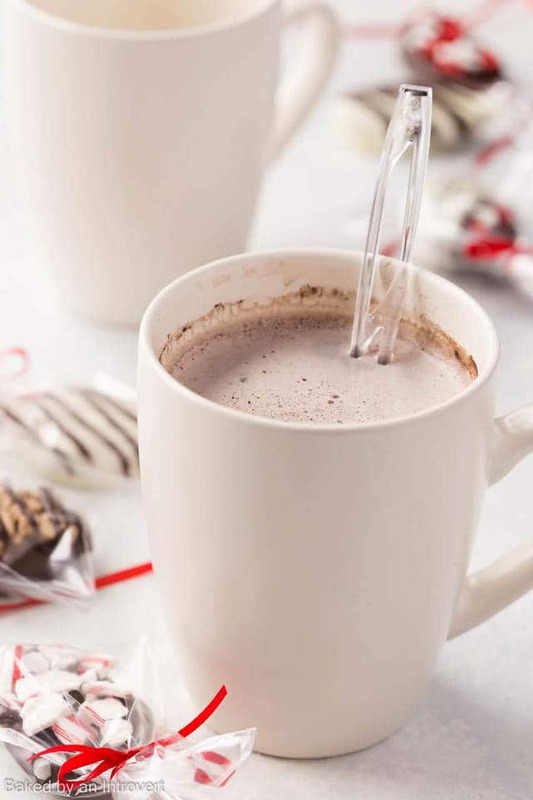 I usually buy the chocolate sticks (spoons) for my son to melt in a hot milk for the breakfast, so if I make a slight change by skipping the coffee granules part, it makes such a nice way to spend time with kid to do our own Choco Spoons ! Thank you and have a happy and prosperous 2017 ! That sounds like a wonder way to spend a snow day with the kiddos! Happy New Year! This is such a fun idea! I would love to give these as gifts! How totally cute are these?! 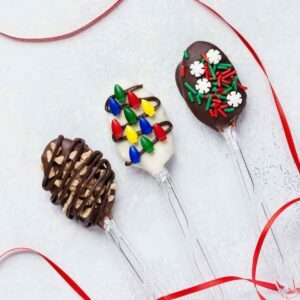 I love the look of those little christmas light sprinkles… but I think my favorite is that dark chocolate toffee spoon! I can just imagine how decadent it would be stirred into my coffee!